St. Thomas Hospital asked TMP to design the renovation, expansion, and modernization of an existing neonatal intensive care unit. 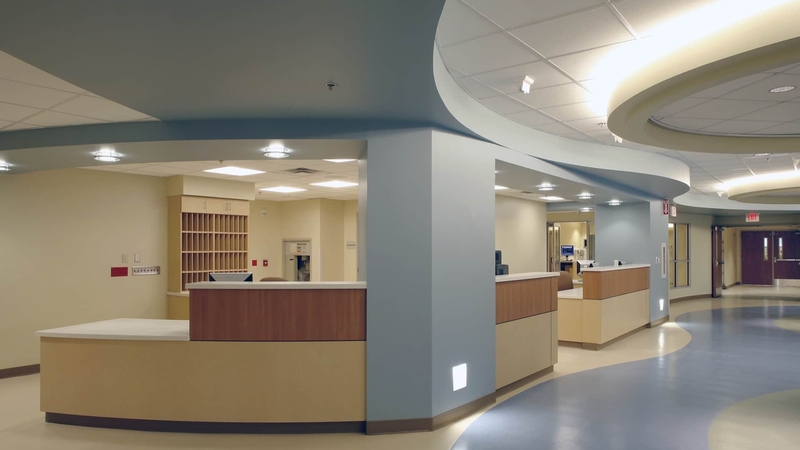 The design team combined an open “pinwheel” concept with private patient rooms. The “pinwheels” were comprised of four-bed spaces rotated around a center column which supplies all of the necessary plumbing and electrical requirements. The use of the single central column optimizes staff visibility and maintains patient privacy. The new NICU at St. Thomas Hospital Midtown has nearly doubled in size, and is now at the technological forefront of neonatal care in the region. Comfortable rubber flooring and textured glass dividers, give the impression of an inviting hospitality environment than an institutional hospital. Natural light sources that can be controlled using mechanically controlled window shades. Egress lighting is provided by nightlights integrated into the wall gives a soft, essential light wash below the sight lines of the bassinets. A Parents’ Suite for overnight accommodations, including private toilet and shower facilities, assists new parents in transitioning their newborn from the NICU to their own home.